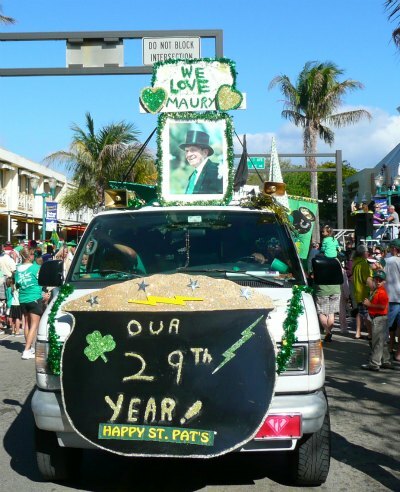 Spending his first St. Patrick's Day in Florida, Maury Power lamented the lack of any local celebration on St. Patrick's Day. With just a little encouragement from his pals and probably a bit too much Irish whiskey, he took up the challenge to have an impromptu parade right then and there. 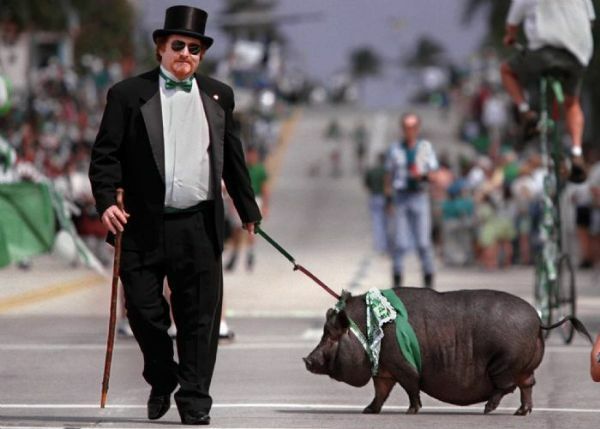 Maury left for a few minutes, only to return with his green pig, top hat and shillelagh, he began his solitary stroll up the middle of famous Atlantic Avenue (much to the delight of his drinking buddies and chuckling passersby). When questioned as to just what he thought he was doing, parading up the middle of Atlantic Avenue, his proud response was, "I'm having a Parade!" 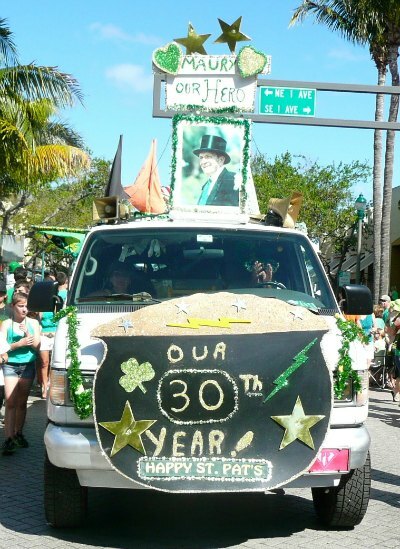 Hundreds of thousands of people have attended the St. Patrick's Day Parade in Delray over the years, and it all started by one man's decision! 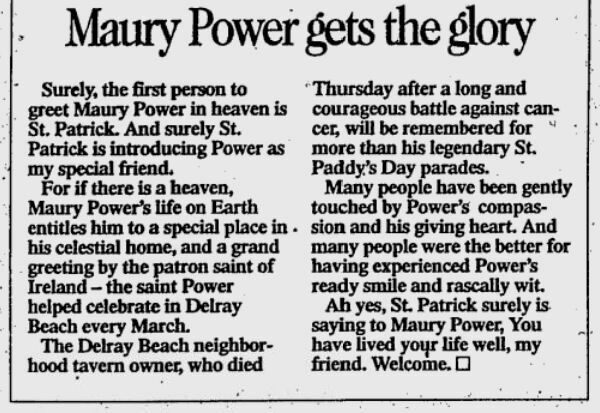 1968 - 1996: From the beginning of the St. Patrick’s Day parade in 1968 until Maury’s death in 1996, the Power’s family kept the tradition of the parade going every single year. 1997 - 2007: When Maury died, Ed Gallagher took it over until 2007 at which point, he turned it over to Nancy Stewart’s company Festival Management Team. 2007 - 2013: Festival Management ran the parade until May 2013, at which point it was turned over to John Fischer and his Code3 Events company. 2014: St. Patrick’s Day March 2014 marked the first year for the parade to be run by Code3 Events. Even though 1968 was the beginning of the St. Patrick's day parade, history tells us that it was really born in 1970 with 6 float entries and $500 raised for charity. 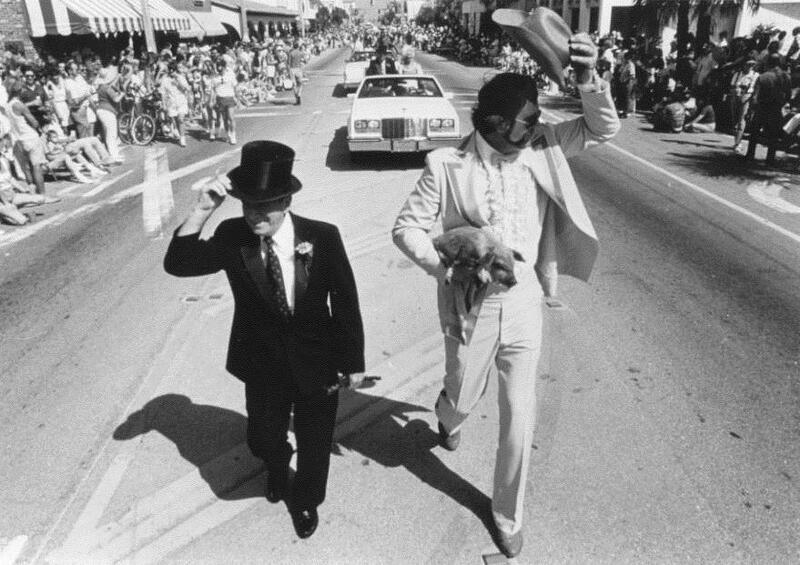 Delray Beach St. Patrick's Day parade founder Maury Power and Dennis Gallagher, carrying the legendary green pig Porkchop. Tim Power and Petunia the pig walking down Atlantic Avenue during the 30th Annual St. Patrick's Day Parade. Petunia is sporting green adornments rather than sporting her usual green dye at the request of local animal rights activists. Thousands of people line Atlantic Avenue to see, touch, pet and photograph Petunia the pig! Maury is never forgotten! Parade after parade....he is always remembered! 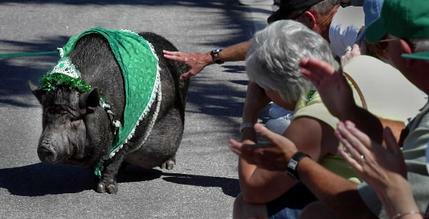 Petunia the pig started practicing her "parade walk" way back in 1995. She marched her 11th year in the 37th annual parade. Her owner Kimberly Vislocky, owner of Kimberly’s Pet Grooming, said Petunia wore homemade green outfits topped off with a green tiara! Petunia was a wild boar mix, purchased from the “Hole in the Wall” feed store in Delray for only $50. She weighed a mere 5 pounds and grew to an extraordinary 300 pounds! She was well-cared for! Eating mac & cheese and drinking V8 juice and preferred her pig food with a side of marinara sauce. 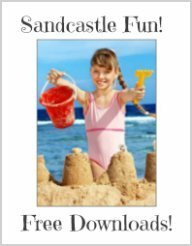 And she enjoyed her medication every morning disguised in an ice cream sandwich. The perfect meal for a pig! She died in December 2010 at 17 years old.She died in her sleep and was most likely covered with her $500 comforter. 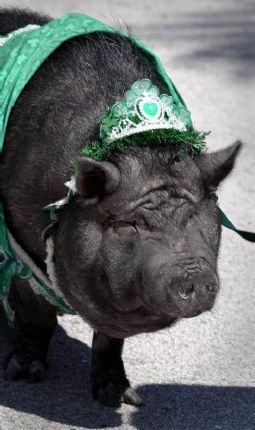 I'm told that her replacement will be Patrick the pig in the following St. Patrick's Day parades. The 42nd annual parade was attended by approximately 85,000 spectators. 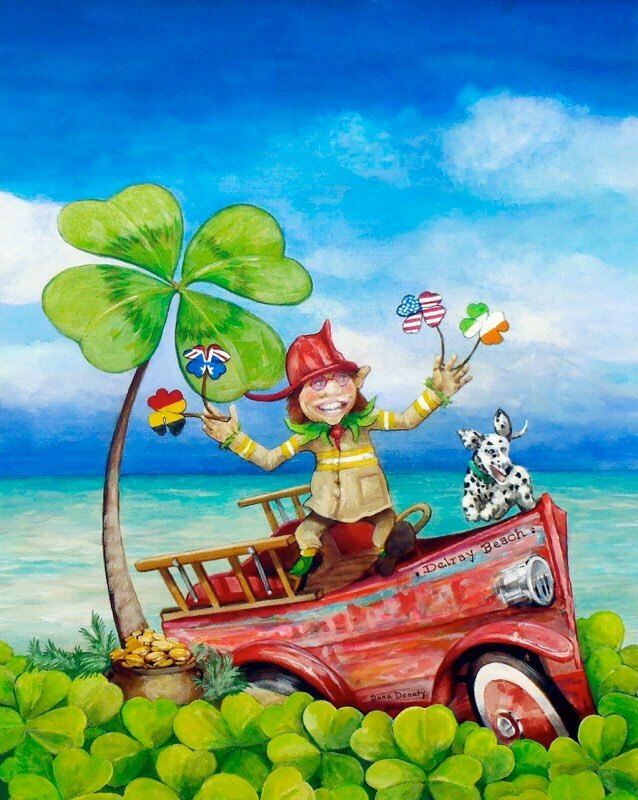 Fire Captain John Fischer got involved with the parade and he began inviting firefighters worldwide – turning it into an international parade with over a thousand firefighters from around the globe. 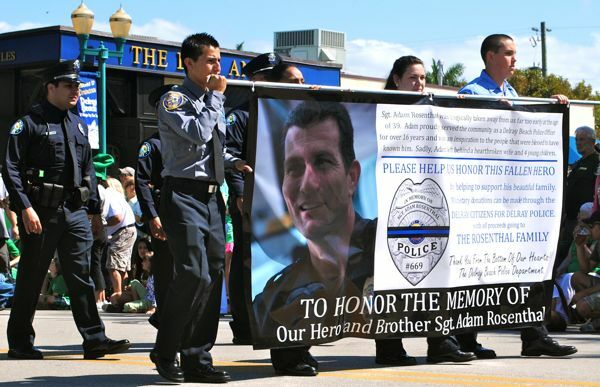 The late Sergeant Adam Rosenthal with the Delray Beach Police Department was honored with a banner. The parade saw the largest attendance ever with a whopping 100,000 spectators and participants coming as far away as Ireland! 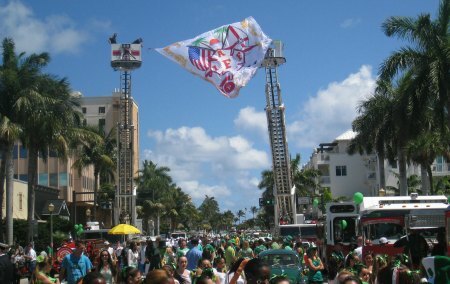 For the first time in the parade’s 43-year history, according to Fischer, five sets of ladder trucks from Miami to North Palm Beach suspended huge flags at the intersections along Atlantic Avenue. In 2012, the parade’s growth had reached numbers that warranted expanding the length of the parade another 5 blocks to accommodate the growing spectators. 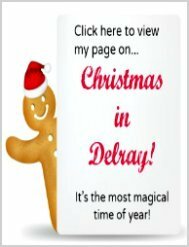 The parade now officially ends at the Delray Beach Fire Rescue's Headquarters station on Atlantic Avenue and NW 5th Street. 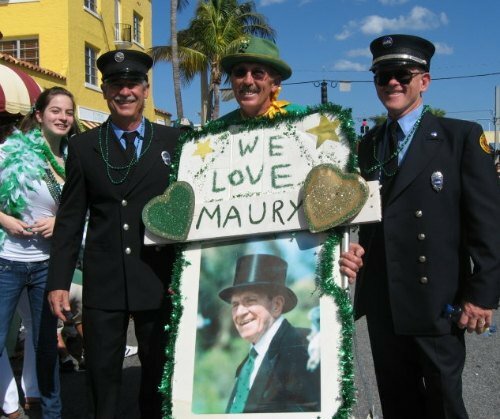 2012 marked the 3rd year of the St. Patrick’s Parade being dedicated to the men and women of the fire services. Leading the parade were 100 Pompano Beach firefighters honoring one of their own, Bill Elliott, who died in the line of duty. Elliott fell nearly 100 feet from the top of a ladder truck during a training exercise in January. His family was given the honorary role of riding in the first truck in the parade. The parade turns into a two-day event! 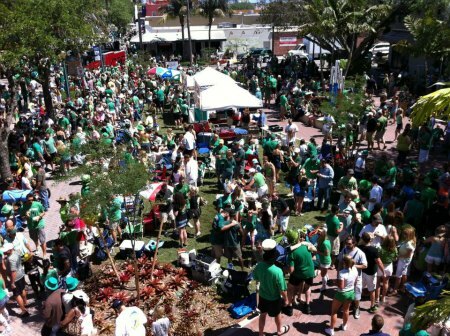 Friday night starts the pre St. Patty's Day celebrations and festivities outdoors on the grounds of Delray Beach Center for the Arts. 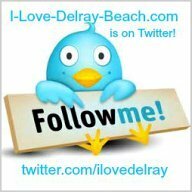 Local Delray Beach artist, Dana Donaty and Donaty Designs was the chosen artist for the parade poster. You can see her design here with this time-lapsed video clip. 2014 marks the first year the parade was officially operated by John Fischer and the new management team, Code3 Events. 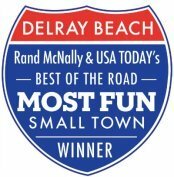 2014, also was notorious for the year that Delray Beach Mayor Cary Glickstein banned the parade’s open-container privileges in an attempt to bring businesses more money as the alcohol should be purchased from retailers. It costs about $25,000 - $30,000 to operate the parade. It hasn’t always been easy to keep it afloat. 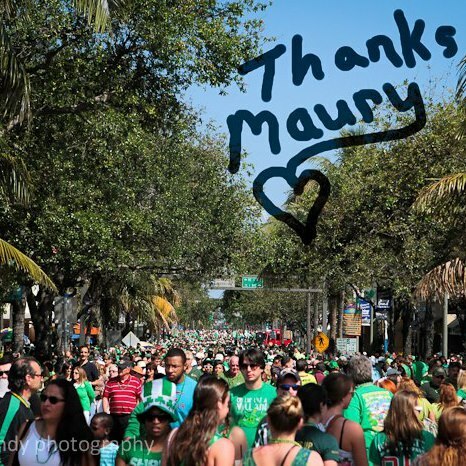 Past organizers of the parade, including the daughter of Maury Power, have handed over the reins, saying they could not make money on the event. This is how crowded Atlantic Avenue gets on St. Patrick's Day. 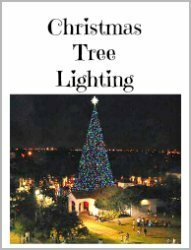 In the past, it has drawn crowds of approximately 100,000 to 150,000. So be prepared!